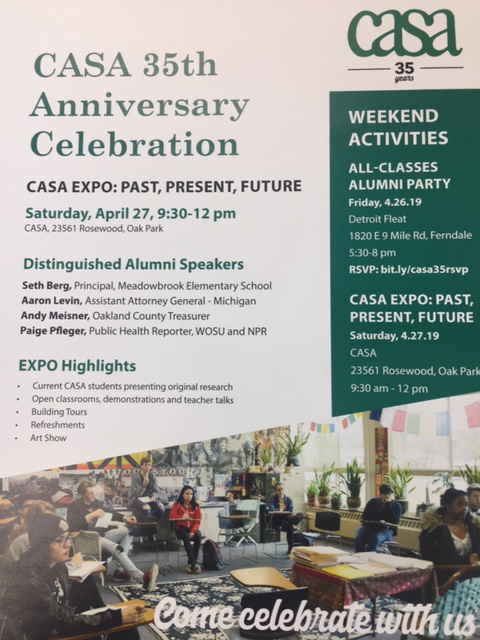 All CASA Alumni are invited to an alumni party at Detroit Fleat in Ferndale on April 26 at 5:30. Everyone, past and present CASA families, students, staff, and the public are invited to the CASA Expo on Saturday, April 27, 9:30 am at CASA. CASA is a consortium school serving Berkley, Clawson, Ferndale, Lamphere, Madison, Oak Park and Pontiac school districts. We offer sixteen Advanced Placement courses, a vibrant visual arts curriculum and a robust advanced dance program. CASA is one of a kind! The concept, the courses and the diversity make the CASA experience truly exceptional. CASA is a seven-school consortium. Students from Berkley, Clawson, Ferndale, Lamphere, Madison, Oak Park and Pontiac High Schools attend CASA in the afternoon. CASA courses are both challenging and rewarding, designed to engage students in higher levels of thinking. Please see the Classes & Staff link for more details. CASA currently offers 16 Advanced Placement courses. Students intending to pursue post-secondary education are encouraged to participate. Students taking Advanced Placement exams may earn college credit upon successful completion of the exam. Advanced courses include three world languages, philosophy, biology electives, world history, astronomy, and genetics, just to name a few.